Tofu is a staple of many Asian and vegetarian cuisines. It is made from soybeans and processed into curds; mature white soybeans are boiled to make soy milk, a coagulant is added, the milk curdles, and then it is pressed, similar to dairy cheese. Tofu most often comes in blocks which are available in different textures from soft to extra firm; it is also sold in a silken form. The length of pressing time (which averages 15 to 20 minutes) is relative to the number of curds and the desired firmness. The longer it is pressed, the more whey (liquid) is released, and the firmer the finished product will become. Tofu is high in protein, which makes it popular in vegetarian cooking. When compared to an animal protein, it is found that tofu is better at lowering bad cholesterol. As long as you have no sensitivity to soy, tofu can be a great addition to your diet. It is also a versatile ingredient, able to take on many different flavors, and can be prepared in several different ways. Each of the different types of tofu works well in different types of recipes. Once you have an idea of the versions of tofu available, you will feel more comfortable choosing the right one for your recipe. An extra-firm tofu block is quite compact and dense, and the curds are tight and visible. It holds its shape well so it is ideal for cubing and slicing. Do keep in mind, however, the denser the tofu the more difficult it is to infuse with flavor, so if you are planning on marinating the tofu and relying on those flavors for the dish, you may want to consider using firm instead. Extra-firm is perfect for slicing and grilling, broiling, and baking, as well as cubing and pan-frying or adding to stir-fries. You can even crumble and substitute in recipes that call for ground meat (like for a vegan burrito). 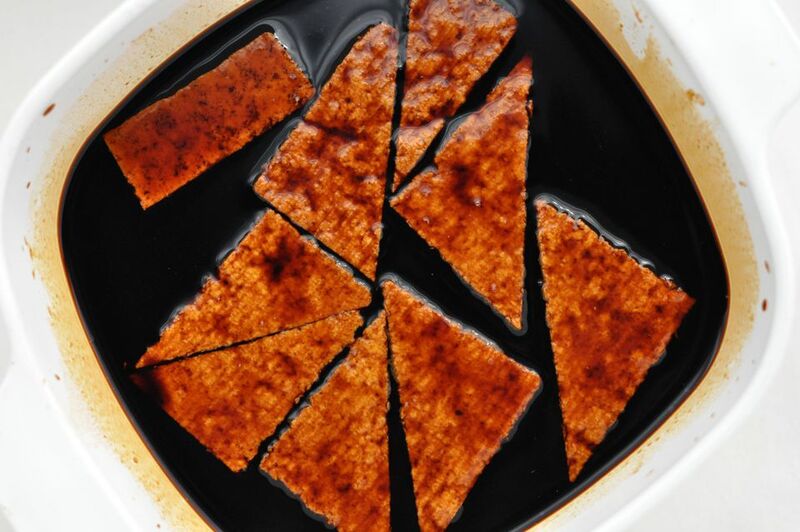 Use extra-firm tofu to make a saucy BBQ flavor baked tofu or a crispy deep-fried tofu. This is another style of tofu that can stand up to heavy handling. Although not as compact as extra-firm, firm tofu still feels solid. Unlike extra-firm, however, it is successful at absorbing flavors so is ideal when marinating before cooking. You can also use firm tofu when making a vegan baked pasta dish as a substitute for ricotta cheese; it also works well in a vegan "scramble" to mimic the texture of eggs. Firm tofu is ideal to use in any of your stir-fry dishes, such as a tofu and spinach stir-fry or stir-fried tofu with mushrooms and oyster sauce. Medium tofu has a rougher texture than soft—the curds are visible—but will still crack with handling. Because there's more whey in medium-firm tofu, it may break up during vigorous stir-frying, and pan-frying can lead to flimsy tofu planks. It can have a droopy appearance due to its moderate moisture content. It's good for dishes that don't require much manipulation like braising or boiling and is the choice tofu for soups such as miso. Feel free to try a stir-fry, though, like a Thai vegetable stir-fry with tofu or Mapo tofu, a traditional Szechuan dish that combines Chinese black beans, chili bean paste, and Szechuan peppers. Soft tofu is block tofu that is curdled, but it is pressed for the least amount of time of all the block tofus. The curds blend seamlessly into the remaining whey. It has a delicate body, similar to Jell-O, and a mild, milky flavor. Its similarity to soft desserts makes soft tofu a great neutral base for mixing with sweets but it works equally well in savory dishes. Because it has a high water content, soft tofu is not recommended for shallow-frying—the sputtering and spit-back can be dangerous—but works well when braised. Silken tofu is one of the most common tofu styles. It's made in a similar process to block tofu except that the soy milk is coagulated without curdling the milk. It's also left unpressed, so every cake retains all of its moisture while cooling. Because curds never form, the tofu has a smooth and "silky" appearance. Silken tofus require delicate handling or else they fall apart and are best used in sauces or smoothies like a blueberry tofu smoothie.